Step 1: Place the sugar, tea bags, lemon slices, cloves, cinnamon, nutmeg, ginger, and water into a saucepan, and stir until the sugar has dissolved. Bring to a boil, reduce heat, and simmer for 10 minutes. Remove from heat and let mixture cool. Strain out and discard the spices, lemon, and tea bags. Step 2: Pour the white wine into a large jar or covered container, and mix with the tea mixture. Stir in apples and cranberries; mix in the apple brandy. Chill in refrigerator 24 to 48 hours. Serve cold. 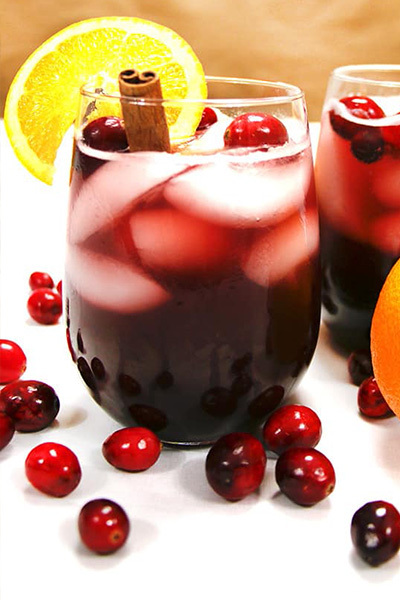 Enjoy this delicious sangria from AllRecipes!